I think Opossums are so cute. Many people fear them because of their 50 pointed teeth, but they are not aggressive animals, nor are they destructive as they do not destroy property or dig in the soil. Maybe it's the long tail that reminds people of rats. They are solitary animals and despite the appearance of being able to be mean, they are most often a target of unnecessary cruelty in urban areas. 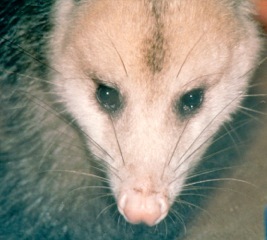 Opossums are a far lower health risk to humans than cats and dogs. They have a high level of immunity to diseases and are more resistant to rabies than any other mammal. We've all heard of "playing possum." If attacked and unable to run, it puts up a bluff of collapsing and playing dead. This can cause the Opossum to be comatose from 40 minutes to 4 hours. Don't dispose of a "dead" Opossum unless you've given it time to be sure it's dead. An adult female may be carrying her babies in her pouch which might make her more defensive. if you harm or kill the mother the babies will definitely die. They cannot survive without being attached for mother's opossums present a far lower health risk to humans than dogs and cats. milk. They are the only marsupial in North America that is related to the Kangaroo & Koala. A female gives birth two times a year less than 2 weeks after conception. She will produce from 5 to 8 little ones that remain in her pouch until able to walk around on their own at about 4 months. They are so tiny at birth that you could put 10 of them on a teaspoon. We get Opossums visiting our veggie and fruit scrap area and in the summer I sometimes get to see them. Now that it's getting dark early and I'm not on the porch to see them, they feed without being seen. They don't actually have a territory that they stay in, moving on in 2-3 days. They are always on the move to find an area with food sources. Females stay in a smaller area while they care for their young and their dens can be found in the burrows of other animals, rock piles, hollow trees, under buildings, in stumps and any available spot they consider cozy. Opossums can be considered a beneficial addition to your wildlife habitat. They eat mice and rats, consume dead animals, prey on moles and shrews, eat all kinds of insects including beetles, crickets, cockroaches, and consider slugs and snails a delicacy. They do like overripe grapes, fruit and berries. Helping to maintain a clean, healthy environment, they're known as "Nature's Little Sanitation Engineers." Learning tasks ranks Opossums above dogs in intelligence. If you find one in your garden, consider it a blessing since it will eat harmful pests. Due to its many predators, few Opossums survive to be adults and those that do only have a life expectancy 1 to 2 years due, with man being the worst offender.